Also, Amazon offers to get Night Ride for your Kindle Fire for free. 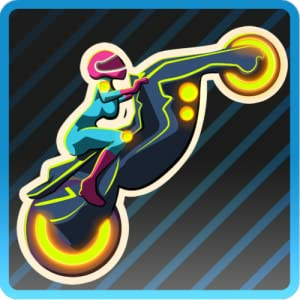 Feel the thrill of motorcycle racing like never before in Night Ride, the sci-fi racing game by Black Bunny Studio. Collect points, use exciting power-ups, and try to last as long as you can while you indulge your need for speed. You’re zooming down the highway on your high-tech motorcycle. Collect points by hitting various lighted targets on the road. Some of these targets are awesome power-ups, such as a laser gun, turbo boost, and a bonus that increases the width of your bike, making it much easier to hit the lighted targets. But watch out! You’ll want to avoid zapping yourself with the high-voltage electric beams placed in your path. Level-up by unlocking achievements. Each level increases your score multiplier and makes the game more challenging. Don’t take your eyes off the road for a second. You’ll be riding against tough opponents from around the world. Compare high scores and achievements with other players through OpenFeint. Download this game here!